It is Children’s Day and Tamama finds he’s lost his tail. 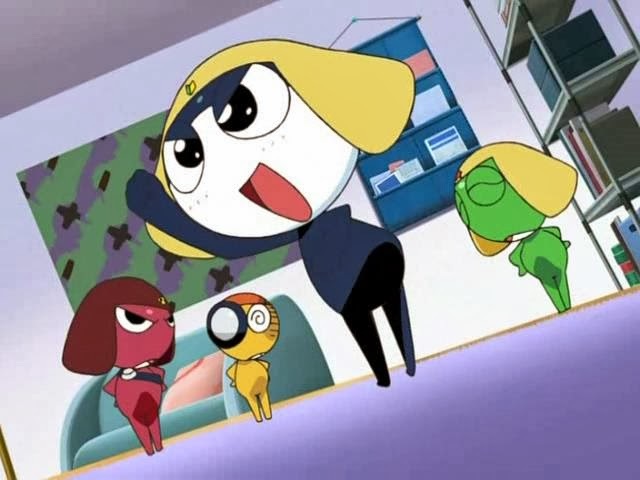 Keroro, Giroro, and Kululu help celebrate by getting sushi. They mention that as an adult, one can now buy, drink, and hit. 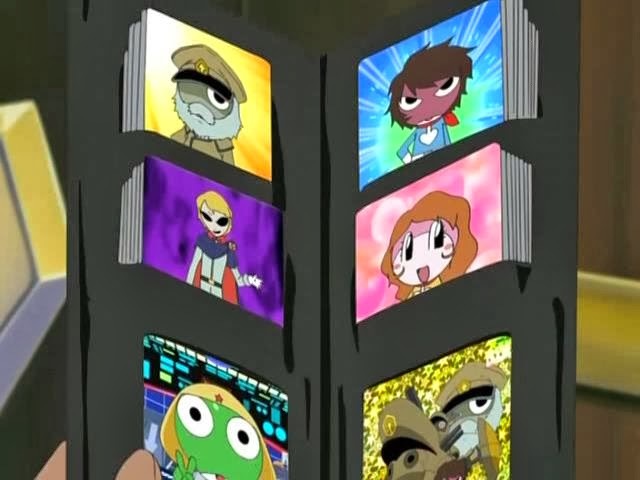 Giroro and Kululu won’t explain and Keroro is to involved in his collector’s cards to notice. 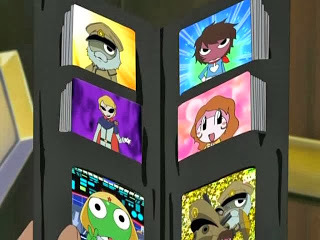 Tamama buys cases of the same snacks as Keroro, scoring a gold card on his first package, depressing Keroro and leading Tamama to know what “buy” is. Tamama heads underground to an adult, alien place, ending up at a bar, where he buys a cola on the rocks. 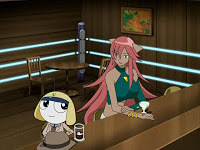 Seeing another patron use a card to pay for their purchases, Tamama says he has a gold card, which gain him attention from an alien named Sayuri, who steals his wallet, but discovering nothing inside, she gives it back. When the police come to bust her, Tamama decides “hit” means fight, so he attacks and escapes with Sayuri. However, his tail has returned and she tells him that he wouldn’t last in the world of adults. She disappears, but Tamama feels sure he’ll see her again. It is Golden Week, so Momoka has a trip with Fuyuki planned, but Keroro, Giroro, and Tamama tag along. Keroro accidentally hits the emergency eject button, sending them all out of the plane. Momoka wakes up to Fuyuki and is happy. When she realizes they are on a deserted island, she decides not to press the gem on her blouse for help. After catching fish for herself and Fuyuki, she helps make an SOS out of wood. The two go looking for water in the nearby forest, which Momoka notes is rather artificial looking. The two are soon attacked by Keroro, Giroro, and Tamama in power suits, but not acting themselves. Momoka defeats them, so they combine into a super mecha unit, which then captures both Momoka and Fuyuki. Momoka realizes she has no choice but to summon help, which she does. At the same time, the mecha gets fried in electricity and comes apart. Kululu reveals that this island is his testing ground, so he took advantage of his unconscious team mates to do some testing. A couple of OK episodes here, but nothing too special. 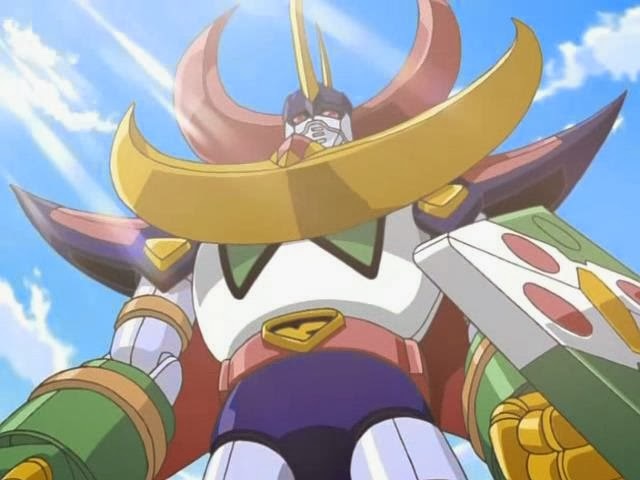 The first story had some Space Battleship Yamato references with the in-series parody anime/manga franchise having the collectors cards thing. 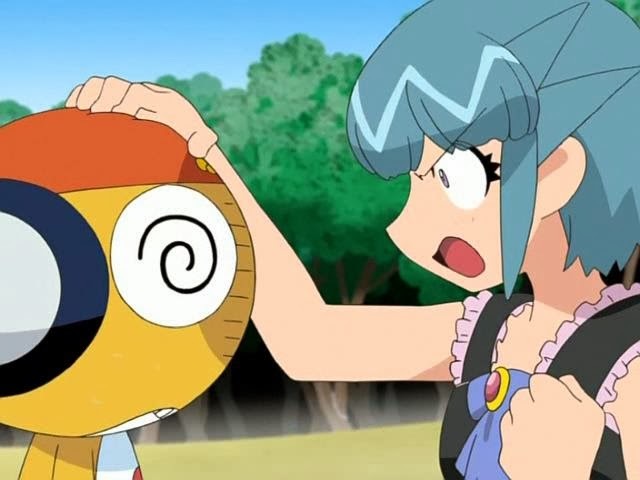 Tamama becoming an adult was kind of fun, though the excuse to return Tamama to a non-adult was weak. Not that I didn’t expect the status quo to be reset, but it would have been refreshing to have left Tamama as an adult. For the second story, we get a parody of the combining mecha genre, though I don’t know which specific series is being parodied. As to the island itself, I couldn’t say what, if anything, was being parodied here. As with the first story, the status quo is returned in the end, which is always the element of these kinds of series that I don’t like. I mean, it would have been nice for Momoka to get somewhere with Fuyuki. In the end, a couple of OK stories, but as I said, nothing special.